I moved down to South London a few months back, now living in Battersea. As part of my new life south of Thames, I no longer commute into work using the tube. I am now going "overground." Overground is how Londoners describe the commuter trains. The trains come in from all directions - north, east and west - but are most prevalent in the south. This is because there are few tube lines south of River, so the trains act as us Southerners rapid transit solution. My local station is Clapham Junction station. 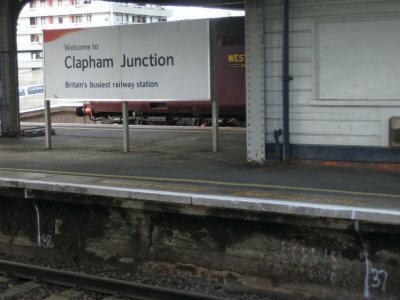 Clapham Junction is "Europe's busiest train station" by the number of trains which pass through it. 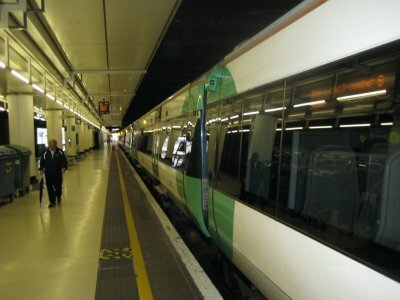 There are 2,000 trains a day which pass through the station. Clapham Junction is on the mainlines running into Victoria and Waterloo stations, and away from London heading to the southwest and south. During the busiest hour there are 180 trains per hour passing through Clapham Junction. 117 of those trains stop at the station. The good news is that means I never have to wait long for a train heading to Waterloo, near where I work. There is usually a train every two minutes during the rush hour. The bad news is that as in addition to serving the local community, Clapham Junction is also one of the busiest transfer points on the rail network, and thus there is always a lot of people waiting for those trains. It is not uncommon for me to have to wait for three or four trains to go by before I can squeeze on one of the trains. To make it easier for those people waiting to get on the trains, on many of the platforms they have painted lines to indicate where the doors will open. This makes it easy to know where to stand to get on the trains, but does lead to a rather uneven distribution on the platforms, with everyone crowding around the areas where the doors of the trains will be. When the train arrives, those getting off squeeze through a small channel through the crowds, as those waiting to get on the train wait with nervous anticipation to get onto the train. Once the last person is getting off, the crowd surges forward to push on to the very busy trains. It isn't complete chaos, though. It has a certain order to it. As there is never enough space on the train for everyone, there is a certain amount of jostling for position. At the same time, there is an honour to it - people do look at each other - making eye contact, and allowing those who have been waiting the longest to get on first. I have never really been sure what to call this process by which people wait for trains at Clapham Junction. It's not a queue, but it does have some order to it. Last week, it came to me. It is lumping. Lump (verb) - to wait and board trains in small groups huddled around where the doors are projected to be. 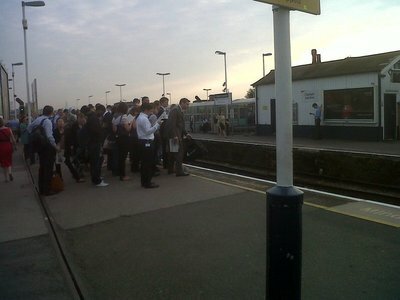 Lump (noun) - the group of people waiting to board a train huddled around where the doors are projected to be. And thus it is defined. My daily commute starts by heading to Clapham Junction and lumping to get on a train.